Here is the story that about the start of these paintings. Our kayaks slipped quietly through the marsh grass and grazed the oyster beds in the shallow shoals behind the Island. Our destination was the small herd of horses in the distance, remnants of earlier generations of shipwrecked ponies. 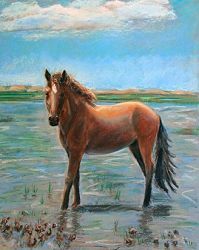 brushing the salt water. A bay, a dun and a chestnut. One was a young stallion who lifted his head as I clicked my camera, then returned to his task of foraging. I watched with fascination. 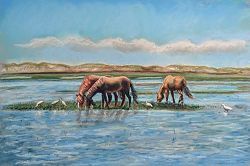 Surrounded by a dozen white ibises who worked alongside the animals, these ponies stood fetlock deep in salt water oyster beds and plucked at the marsh grass for hours. 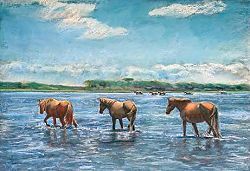 The breeze rippled their manes and tails and gave some relief to the heat. But there was no fresh water here. How long could they graze? Step by step they moved over the beds, diligently eating the reedy grasses that poked just a few inches above the water. A few solitary ponies grazed in the distance and a larger herd beyond them. 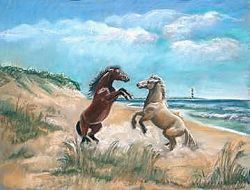 stallion or mare calling to a companion. We had also tried to walk and pull our kayaks in the very shallow area, but found the going too hard and welcomed the deeper water. I paused as we pulled away from the island and took a long drink from my water bottle. 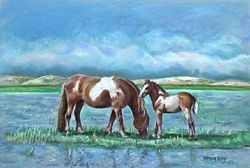 And I waited to see if the ponies walked on to fresh water but they stood quietly in the breeze.